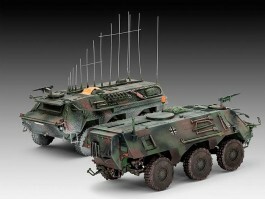 More than 1000 Fuchs (Fox) TPz 1 (APC) have been delivered to the Bundeswehr since 1979. The lightly armoured, all-wheel drive and amphibious transport vehicle has proven itself in numerous conflicts. The Fuchs can be fitted with various role kits depending on its required task. The Eloka Hummel (Bumblebee) role fit has a distinctive antenna array on the roof. The corresponding jammer disrupts enemy communications. The NBC reconnaissance role fit is used to detect nuclear and chemical warfare agents. The special shape of the NBC Tail allows sampling from within the vehicle whilst maintaining full NBC protection.